Android Wear 2.0 is finally here. Or at least it's starting to roll out; at the moment only the LG Watch Sport and the LG Watch Style are running the fancy new OS, but the rest won't be far behind. If you want an entire breakdown of the key features you can expect, head to our Android Wear 2.0 guide, but we can tell you right now that this is Google's most important Wear update to date. As Apple, Samsung and Garmin, among others, stake their claims to be crowned the king of smartwatches, and with Fitbit's first smartwatch seemingly on the way, it's time for Google to start proving why its smartwatch platform is as serious a contender as any other. And is it any closer to selling the argument that we need smartwatches in our lives? We've been living with Wear 2.0 on the Sport and the Style for a few weeks now, so here's our verdict on Google's smartwatch overhaul, and whether it was worth the long wait. If you've been using Android Wear right from the start then you'll immediately notice the dramatic facelift that the OS has been given. The Google Now card-inspired UI has gone, replaced with the new darker Material Design theme that's already been kicking about on smartphones. It's given Wear a more serious, sophisticated feel, and while the card approach wasn't terrible, it tended to clutter the screen, covering half of the watch face with information we didn't always find useful. That's no longer a problem in 2.0, while the option to add complications provide another way of getting information. It means more of seeing things that you actually want, not what Google Now thinks you might be interested in. It's a simpler, more streamlined design – and we're all for it. Google hasn't entirely ripped up the UI script, keeping elements and gestures that have been there since day one. You can still pull down on the screen to quick launch features like screen brightness, settings and airplane mode; but rather than making you swipe along to browse them as before, all the icons are now bunched together for convenience. 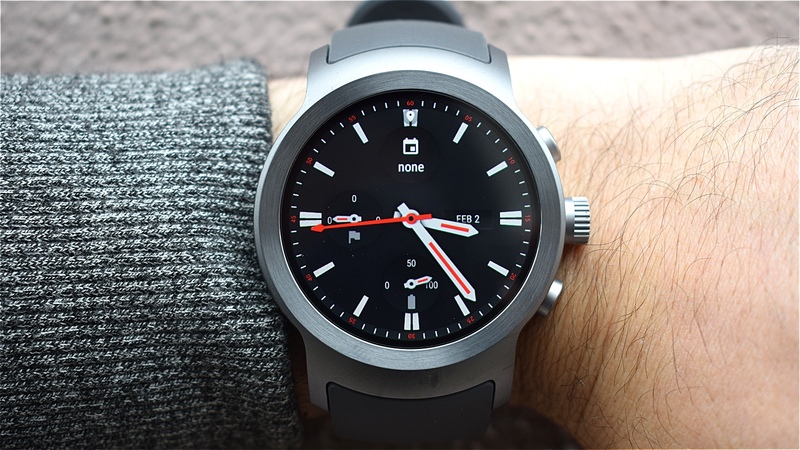 If you want to browse through watch faces, simply swipe right – or swipe up to see your stream of notifications, which can be dismissed with another swipe to the right. One problem with Wear in the past was that if you were picking it up for the first time, you'd need to spend a lot of time working out where everything lived. Now not only is the layout much simpler, but Google's decision to integrate support for physical features in Android Wear 2.0 also aids navigation. In the case of the Sport and the Style, this takes the form of the watch crown that launches the new-look app drawer. While some might regard it as a backward step when Google previously made a big push on voice navigation, we've found it's actually made operating the OS easier and slicker. You can still use your finger to scroll through menus – and you still have to tap on apps to open them – but there's something elegant about rolling that crown. It's a lot better. As a smartwatch platform, Google has remained pretty rigid about the level of customisation and tweaking that can be made by hardware for Wear to live on, but it's loosening the reins to a certain degree. More customisable watch faces have appeared on the platform before, but they've been given a new lease of life thanks to the addition of complications. These are essentially small widgets that can be added to any watch face and display live snippets of information from first and third-party apps. Developers will be able to build these into faces as they wish. Read next: Apple Watch v Android Wear - who reigns supreme? If it sounds familiar, that's because Apple offers something very similar on the Watch Series 2, Watch Series 1 and original Apple Watch, thanks to watchOS 3. While it might not seem like a radical change, this is one of Apple's best software features and a welcome addition to Android Wear. This type of useful glanceable information, without having to spend too much time fiddling around for the relevant apps, is definitely what the OS needed. Notifications are a big part of any smartwatch experience, and as we said above Google has streamlined things in this department. The point is to instantly access information you'd normally have to reach your phone for, and indeed Wear 2.0 is better at negating the need to fish into your pockets. Notifications no longer dominate the screen unless you actually want to deal with them. Whether it's replying to a text or archiving an email, when you do choose to acknowledge these notifications with some sort of action it's a simpler interaction. Which leads us to the messaging options, which now include smart replies, handwriting responses and using the keyboard. Smart replies are pretty straightforward while handwriting and keyboard responses are good but not perfect. At times, we can hammer out messages quickly and the predictive text mode is very good. Ultimately, though, you're still typing on a small screen, and that's just never going to be ideal. Google's big push is on helping to make its smartwatch OS standalone, whether that's by adding LTE support for certain models or Wi-Fi, which unlocks the ability to access features like the new Google Play Store that has been optimised for Wear watches. That means you no longer have to go to your smartphone to download apps directly to the watch, and you'll avoid any syncing issues you had in the past. While the main home screen is very much a scaled back version of the mobile app, it is at least pretty to easy to navigate with voice search support included. However once you expand apps to view recent reviews or additional detail, it's almost as if that's where the optimisation ended, leaving it all feel very crammed. Still, we're glad the Play Store is now baked in. Going back and forth getting apps between your watch and phone wasn't ideal. "Where's Google Voice Search?" you ask. Well it's kind of been replaced by Google Assistant, which has already popped up the Google Pixel smartphones and Google Home smart speaker. It works on the same principle, where you hold down the middle button (the crown, in the case of the new LG watches) and then make commands or requests with your voice. The idea is that you can have two-way conversations, but in reality it's not quite as slick as that. It's quite good at recognition and can naturally fill in gaps in speech it didn't pick up, but the results are varied. After asking one question you can provide a simple follow-up, and Assistant should draw context from the previous exchange, but you'll need to press the button again to do so. The results in our testing have been varied. Sometimes it recognises sentences perfectly and delivers the right information; other times it isn't so helpful. On one occasion it pointed us to a Wikipedia page when we asked the score in the African Nations cup final. But when we asked how long it would take us to get to work, it helpfully showed us and launched Google Maps to navigate to our destination. It works fine for setting reminders and asking things like the weather forecast, but when we asked it who invented sushi (an example question Google itself gives) it, again, simply pointed us to the relevant Wikipedia page. With the new update comes support for Android Pay on smartwatches. We've tried it out with the Watch Sport and it works great, even if it doesn't have Samsung Pay's nifty trick for working with magnetic stripe terminals. The problem with Android Pay is that you don't just need a watch with the new software update, but one that has NFC inside too. Right now the only device that ticks both boxes is the LG Watch Sport, and among existing devices only the LG Watch Urbane LTE will support Pay after the update (as Google confirmed to us). Hopefully this means we'll see most future Android Wear smartwatches rocking NFC, although its a shame the LG Watch Style isn't setting an example. Speaking of compatibility, iOS support is another string to Wear 2.0's bow. Wear watches have worked with iPhones for a long while now, but it's been a very limited experience. Now there's a lot more parity between Android and iOS smartphones – read the full explainer here. By integrating the Play Store into Android Wear 2.0, iPhone users can download many of the same apps and get the exact same experience. Even Android Pay will soon be working across both, although there are still some restrictions in how apps like Google/Apple Calendar, Google Fit and Apple Health integrate. You also won't get iMessages on Android Wear. Google, much like Apple and Samsung, realises that fitness is still a big part of what people want from smartwatches. That's why the Gear S3 went big on it and Apple went from style icon to running and swimming companion with the Series 2. Google Fit is Wear's answer to S Health and Apple's Workout software. It's now broken into two apps: Fit is where you can glance at daily activity tracking and initiate a tracked workout, whether that's walking, running, cycling, stationary bike or even a press-up challenge; Fit workout is essentially a shortcut to those sports tracking features. There's also an option for strength training which tries to detect what type of stationary workout you're doing, and counts the reps. This may be useful to some, and left untouched by others. At first it seems a little unnecessary to split Fit into two apps, but if you only care about having something to act like a Fitbit, then it makes more sense. It's still a much more basic offering than Samsung and Apple provide, but that might be fine if fitness is not your primary concern. It definitely doesn't feel like a big priority as far as the entire ecosystem is concerned. Android Wear 2.0 is the overhaul Google's smartwatch OS needed. Not only does it make Wear more independent from the smartphone, it now gives iOS users better reason to opt for a Google-based smartwatch. Assistant and Fit need more work, and as ever the quality of third-party apps will shape the experience, but Wear 2.0 is a welcome leap forward.